It was a 15th century mill that has been transformed into a beautiful, country villa. The villa is located in the countryside next to a natural stream. Its thick walls keep the house cool in summer. In the surrounding garden there are old cypress and oak trees. There is a salt water heated swimming pool (6m x 12m; 2.4m deep) with an infinity edge and a restored 2-story barn located between the main house and the stream. A spacious paved terrace can be used for al fresco dining. A typical unpaved road leads (800 mt) to the house and provided parking. The main house is furnished with antiques and features unique Italian décors. Ground Floor: The entrance leads directly into the large living room: here there are a fireplace, piano, and satellite TV. 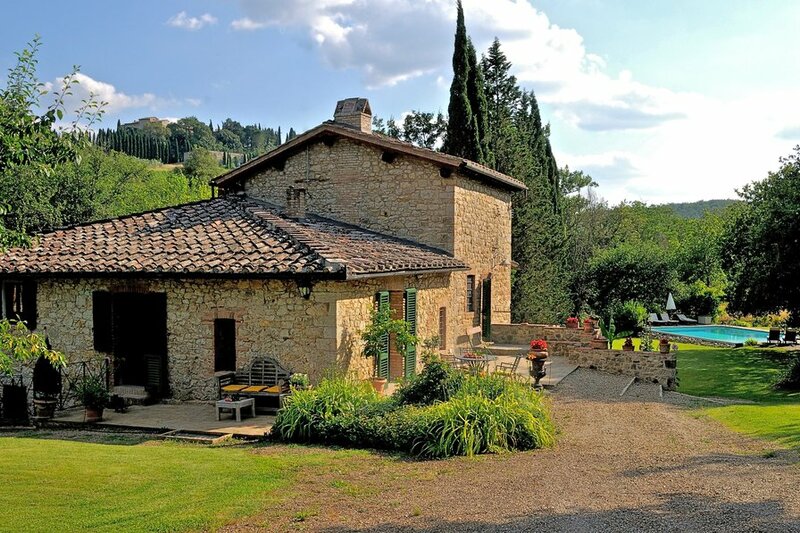 There is a spacious eat-in country kitchen with oven, dishwasher, microwave, Italian coffee maker, toaster, refrigerator and large wood burning oven. Adjacent to the kitchen there is a dining room with a table seating 8-10. On the ground floor there are three bedrooms, two of which are double bedrooms with queen-size beds, and the third one is a twin-bedded room. The bedrooms share two bathrooms, one with tub and handheld shower-head, and one with a shower (with wall mounted shower head). First Floor: A steep staircase leads up to a spacious loft with a queen-size bed, a single sofa bed, and a small balcony. There is a bathroom with shower, toilet and sink. Lower Level: From the garden, a separate door leads into a laundry room with sink, washing machine, and iron and ironing board. The laundry room is accessible and exclusively available for guests. Also on this floor are the homes' original stables and wine cave; both the stables and the wine cave are used for storage by the owner. The guesthouse cannot be rented separately from the main house. The guesthouse has a yellow living room with antique sofa, table, and TV. There is a double bedroom and ensuite bathroom with shower. The restored 2-story barn is located between the main house and the stream. The ground floor of the barn is equipped with a sink and is an ideal spot for al fresco dining (the upper floor is closed to guests). The small Tuscan town of Gaiole lies in the Chianti Castles territory to the east of the Via Chiantigiana in the Chianti Classico wine zone of Tuscany. The area is hilly, with extensive forests of oak and chestnut, and vineyards and olive groves surrounding the towns and villages. Wild animals, including game species such as wild boar and deer, as well as porcini mushrooms abound in the forests. In addition to the numerous castles, of which one of the most famous is the Castello di Brolio there are some extremely old and interesting churches and abbeys to be visited. Some of the churches date back to mediaeval times, in particular the untouched romanesque parish churches such as the nearby Pieve di Spaltenna. Among the former abbeys in the area, the most famous and photogenic is Badia a Coltibuono and its restored Classical Italian garden. Among the nearby towns and villages of interest are Volpaia, a village now almost entirely given over to wine production and home to several good restaurants, and Radda in Chianti and its unique Palazzo del Podestà. A splendid Abbey- “Abbazia di Monte Oliveto Maggiore”- positioned in a rare and unusual panorama can be found within a 25 minute drive.